Stuart Townend is one of today’s leading worship songwriters. His hymns have led him to be compared to some of the greatest ever hymn writers such as Watts and Wesley and in 2017 he received the Thomas Cranmer Award for Worship from the Archbishop of Canterbury “for his outstanding contribution to contemporary worship music”. 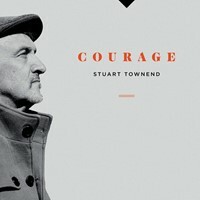 Last autumn he released his tenth solo album, Courage, probably one of the most personal pieces of work he has ever produced. I caught up with Stuart between tours to find out more about the album and one poignant song in particular. CJ: Many will have seen the piece on BBC’s Songs of Praise where you shared the story of losing your brother Phil to cancer and the song “Keep You Here”, which you said was your initial response to the news of his diagnosis. How did the song come about and what does it mean to you? ST: Yes, I never had any intention of talking publicly about my experience, let alone writing a song about it! It was just something that came out quite unexpectedly after hearing a fellow songwriter talk about writing ‘from the well’ of our own experience and feelings. As someone who tends to consciously ‘craft’ my songs slowly and carefully, especially the lyrical side of things, to write something spontaneously that felt so raw was a bit of a new experience for me. But I suppose it is that sense of vulnerability which has given the song such a resonance for many people walking a similar path to mine. CJ: How important was it for you to have Phil’s voice singing on it? ST: Very important. I played an almost finished version of the song at my mum’s house at Christmas 2016, when the whole family had gathered from different parts of the world to be with Phil. And afterwards Phil asked if I was going to put it on the next album, and if so could he sing on it? And I thought, ‘yes, that would be great’. CJ: And how important was it for you to have other members of your family involved in the album? ST: It’s not actually the first time I’ve used the family on my albums. Joseph (my eldest) is a great drummer, and played on my last album, Paths of Grace, as did Eden (my youngest), who is a brilliant guitarist. But it was the first time they were involved in overseeing the arrangements. And it’s the first time my daughter Emma has been involved, both as a singer and a co-writer. So that has made it particularly special, as many of the songs reflect the journey we have shared as a family in recent years. CJ: The album seems to take a journey from praise (in the first three songs) through reflection and on to hope. How does that reflect the journey you have been on in the last couple of years? ST: I think there’s some truth in that, although it would be a mistake to think of it as some kind of linear journey from one to another. Sorrow, hope, confidence, doubt, praise have all been (and continue to be) features of the last two years, often at the same time, but all at a deeper level than I’ve known before. I’d say that grief and everything associated with it has opened many doors to a deeper level of feeling, and a deeper thankfulness and appreciation of loved ones, and of the gift of life itself. CJ: Your daughter Emma’s moving song “I am here for you” is a very personal one borne out of her own struggles with mental health issues. She has spoken powerfully during your tour about what courage really means to her. Is this the ‘new’ courage you talk about on the sleeve notes? ST: Yes, it’s the courage to recognize the pain we all carry, the courage to be able to talk about that pain with others, and the courage to sit with others who are going through pain without making judgements or offering solutions. There’s a great quote from Brené Brown that has really impacted me: ‘vulnerability is the thing we most want to see in others, but the thing we least want others to see in us’. That’s been the starting place for me in terms of showing vulnerability and honesty on the public platform, in the hope that it will release others to find the courage to open up about their own hidden pain. CJ: The title song is quite up-beat but with some powerful and challenging words such as, ‘So with each day I’ll choose to say / The past won’t have a hold on me’. What encouragement can you give to others who may be weighed down by their past? ST: I was reading Eckhart Tolle’s classic The Power of Now, and became very aware of how much time I spend mulling over things that have happened in the past – whether that’s 30 years ago or yesterday; and the things I’m planning to do in the future; and how that distracts me from really enjoying the present moment. And yet Jesus’ example of living is of someone who was really present with people, who released people from their past wounds and mistakes, and who talked of the futility of worrying about the future. So the song is my own response to that, and my resolution to fully inhabit and live each day God gives me. CJ: Which of the songs on the album do you hope will be taken up by the church at large – is there another “In Christ Alone” on Courage? ST: Ha! I think it would be a mistake for a writer to try and recreate a song’s success! Songs become popular for various reasons, and although quality may have something to do with it, it’s also about the message it brings at a certain time and place, which is beyond the writer’s control. So it would be folly to try and engineer another “In Christ Alone”! I’ll just continue to write about the things I think are important, the things we don’t currently sing about, the things that will deepen our understanding of and relationship with God, and help us to live in a Christlike way. So some of the songs on the album are for listening to, but others – like “How good it is to sing (Psalm 147)”, “You Have Called Us (May the Peoples Praise You)” and “For the Cause” are strongly congregational. As ever I’ve tried to explore some different musical styles and congregational settings. “Christ Be With Me” is a piece for choir and congregation; “We Believe (Apostles’ Creed)” is in a folk style, with whistles, fiddle and accordion; and “Lead On, Lead On” and “I Am Here For You” have beautiful string arrangements by the genius pianist and arranger Mark Edwards. But at the end of the day my primary calling is to write songs and hymns that churches will enjoy singing, and my hope is that this album will be a valuable resource of songs for all kinds of congregations. Clem Jackson is the former editor of Together magazine and is a trustee of the Christian Resource Centre in Eastbourne where he lives with his wife Janet.